New high quality front hood with mud guards (left and right), painted dark red. New high quality front hood with mud guards (left and right), painted light red. New high quality front hood with mud guards (left and right), painted yellow. GEM Car Front Hood with Mud Guards. Ready for paint. GEM Car Hood Latch Assembly. GEM CAR BUMPER OVER RIDER SET. GEM CAR LATCH SUPPORT BRACKET. GEM CAR MIRRORS CHROME SET. GEM CAR REAR TUBE BUMPER. GEM CAR FRONT AND REAR TUBE BUMPERS. FITS 2004 AND EARLIER. GEM Car hood stickers set. Grey and black. 13 3/4" long, measured diagonally, tip to tip. GEM SPACER 7/8" FOR REAR FENDERS. GEM MIRRORS OVERSIZED. BLACK PLASTIC. SET OF 2. GEM CAR LONG BED REAR BUMPER. GEM SIDE MIRROR REPLACEMENTS. BLACK PLASTIC. SET OF 2. Fits all years. Flat mirror glass. Set of 2 GEM Car 2 Point Retractable Seat Belts, 57 inch. Comes with mounting hardware. GEM Car Mud Guards, also known as fenders. Off-White only, ready to paint. Set of 2 (1 L & 1 R). Fits most models 1999 - 2012. Some early builds used smaller Mud Guards. Check your fit before painting. Polaris GEM Car Rubber Floor Mat. Front only. New high quality front hood with mud guards (left and right), painted dark gray. GEM Car Sunroof gray polycarbonate replacement. New high quality front hood with mud guards (left and right), painted green. 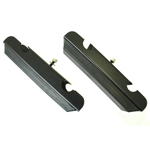 Vinyl handbrake boot kit comes attached to an aluminum mounting bezel with pre-drilled holes.